This DVD includes two heart-touching and inspiring documentaries that could benefit your life.. Master Sha’s Soulfulness introduces Master Sha, a humanitarian, soul leader, and spiritual master , as he travels the world teaching, blessing, and offering ancient and new sacred wisdom, knowledge, and practical techniques to empower humanity to create their best version of themselves. 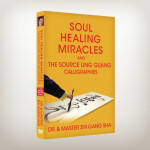 The Source Ling Guang Calligraphies documentary introduces you to the power of The Source Ling Guang Calligraphies. You will hear Professor Lee Chiu Yun, top Chinese character expert, share why she chose Master Sha as her sole lineage holder of Yi Bi Zi calligraphy.